‘Working Together with Your School‘ is the name of the Code of Conduct document that outlines the responsibilities of community members, directorate staff and students to behave appropriately and positively to prevent or minimise non-compliant and aggressive behaviours. Click on the link to read Working Together with Your School. No formal qualifications are required to become a SVPACT mentor. Training is arranged by the Committee through bi-annual orientation seminars for new mentors, and Literacy and Maths Workshops. need to be flexible and adaptable to the student – teacher environment. Patience – it is important to be prepared to progress slowly and steadily and be able to cope with possible lapses by the student. Empathy – having an unbiased, friendly outlook towards young people is vital. Mentors need to accept that children are sometimes embarrassed, tentative or can be overly assertive – just as some adults are. Life Experience – mentors who can share their life experiences, challenges and skills with students are best suited to the SVPACT Program. Mentors who can impart their wisdom and who have an ability to provide a positive role model are also ideally suited. SVPACT wishes to recruit volunteer mentors who display the qualities of social justice, integrity and appropriate behaviour towards students, teachers and other school staff. keen to be involved in fun, friendly and free training workshops accompanied by morning/afternoon tea? genuinely interested in helping children and young people? flexible and able to cooperate with students, teachers and staff and willing to learn from them? able to commit to a volunteering activity for one hour per week during school terms? IF YOU ANSWERED “YES”TO EACH QUESTION – THEN SVPACT IS FOR YOU! Participating schools are expected to nominate a staff member as the SVPACT School Coordinator. Each School Coordinator will ensure that space, equipment, activities and students are ready at the designated times when Mentors arrive. If a student is absent, or on excursion, the School Coordinator will make every effort to advise the mentor that the session will be cancelled. Similarly, the mentor will advise the School Coordinator if he/ she cannot attend at the scheduled time. The ‘Mentor Contact Details and Class Arrangements’ form is provided to the Classroom Teacher to facilitate contact when the student is not available at the appointed time. A professional approach and respect ensures that students, as well as mentors, gain the maximum benefit from the partnership. If you need more instructions to perform your volunteering activity with your student, just ask your School Coordinator. It is advisable to establish an effective communication channel with the School Coordinator and/or Classroom Teacher. Some schools maintain a “Communication Book” in which mentors and the School Coordinator/Classroom Teacher can exchange comments on the progress of the mentoring activity, tasks undertaken and other matters of mutual interest or concern. This method is particularly useful in those circumstances when direct discussion is not practical. All teachers and staff in schools have a mandatory responsibility to report to relevant authorities any concerns they may have in relation to student welfare and well being. Mentors who have concerns about their student are advised to discuss their concerns with the School Coordinator or Classroom Teacher. In accordance with the ACT Education and Training Directorate’s ‘Working with Children and Young People – Code of Conduct for Volunteers’ you must “…observe confidentiality in respect to all information gained through your participation as a volunteer.” See the complete Code of Conduct for Volunteers. In terms of what you learn about your student, confidentiality between you and the SVPACT School Coordinator is paramount. For example, a casual comment outside of the school may be misinterpreted and be devastating for a student, his/her family or SVPACT. If you have questions or concerns, please discuss them with either your SVPACT School Coordinator or a member of the SVPACT Committee. When you first visit the school where you will be a mentor, you will need to take your Working With Vulnerable Card. The SVPACT provides public liability and personal accident insurance cover for all volunteer mentors. All visitors to schools are required to sign on and off on the Visitor’s Attendance Book located in the front office of the school. All mentors are required to produce their WWVP cards when requested by school staff. SVPACT Committee: The SVPACT Committee aims to support its mentors according to best management practice. Working in partnership with school staff, SVPACT mentors make an important contribution to the school community SVPACT Committee Members are available to answer queries or assist in the implementation of the SVPACT mentoring service. 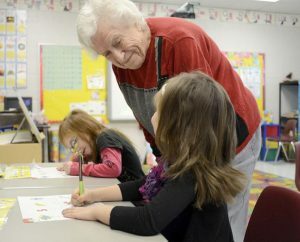 The Committee consists of current and former principals, retired teachers, current mentors, and volunteers with many years’ experience in community groups. The Committee organises regular training and networking opportunities for SVPACT mentors. We welcome your ideas and feedback on all aspects of the program. what are your mentoring duties? what to do if you are unavailable? what to do if the student is absent? Be yourself! Accept that students in the Program you mentor may have backgrounds, vocabulary, manners and values that are different from yours. By being yourself, by caring, by showing up and giving your time to mentor a student one to one you are making a difference! respect the trust your student places in you. In accordance with the ACT Education and Training Directorate’s requirements, mentors are required to sign the Attendance Register on arrival and departure from the school and wear their identifying SVPACT badge while at the school. Check with your SVPACT School Coordinator for the school’s requirements. Mentors are required to adhere to the ACT Education and Training Directorate’s Code of Conduct for Volunteers. Always remember that you are appreciated! Sometimes we get caught up in the day-to-day operations of SVPACT and may forget to say, “Thank you”. You are certainly appreciated and we value the time that you give. You have taken the first step towards making a significant contribution to the excellent education programs in the ACT. Volunteer mentors provide enrichment opportunities that can enhance the education experience for students, whilst also supporting teachers and staff. As a former teacher, I know that teachers can always use another pair of hands. The School Volunteer Program ACT (SVPACT) provides students with that one to one experience that teachers cannot always provide. In every community there are people doing extraordinary things. They not only give their dedication, inspiration and hard work, they give their time, which is so valuable to all of us. 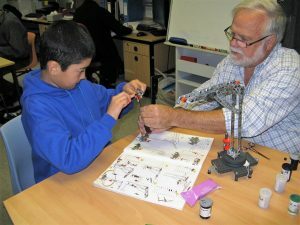 Volunteers use a variety of mentoring activities, including reading, general literacy, projects, Meccano building, crafts and games to build a rapport with their students. With guidance from teachers, you will support what the students are learning in the classroom. We hope this handbook will help you make the smooth transition into volunteering in ACT schools, providing you with an overview of SVPACT and the variety of opportunities that you may wish to pursue. Congratulations on taking up your role in this worthwhile and rewarding program. SVPACT continues to make a tremendous difference, not only to individual students, but also to the wider community.